A native of Berks County, PA, Margaret earned her Bachelor of Fine Arts degree from Penn State University, where she majored in printmaking with a specialty in etchings. She then moved to New Orleans with her husband, where she continued her education at Tulane University, earning a Master of Fine Arts in printmaking. While at Tulane, she taught adult classes in printmaking and watercolor. She also worked in the French Quarter as a freelance watercolor artist. Moving to Houston, Texas, she studied at the University of St. Thomas, achieving a Master of Education degree in Elementary Education and Art Education. She taught elementary school for 22 years in Houston,TX and Lititz, PA, and retired from teaching in 2010. She now works full-time as an artist. From April through November, you can find Margaret at many outdoor art shows around the mid-Atlantic region, including Frederick, MD, Manayunk, Mount Gretna, and Bethesda ROW Outdoor Art Shows. 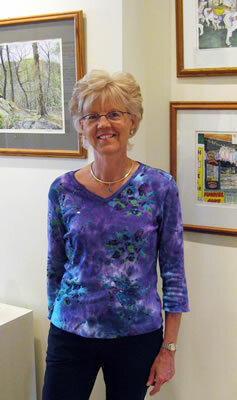 She also shows her work at Lititz Framing and Fine Arts. She has had shows and exhibits at Red Raven Art Gallery in Lancaster, and Accent Gallery in Ocean City, New Jersey. Margaret specializes in watercolor realism. She changes her subjects often, as she turns to different events that pass through her life. Local scenes, unique moments of life, and memorable adventures are typical subject matter. Her paintings are without angst and reflect a down to earth and easy-going personality. Margaret's art studio is not a formal place. It is simply the dining room table. She starts with a realistic drawing. When painting, she slowly builds up layers of paint, creating a rich, three-dimensional, realistic likeness of each subject. The painting is enhanced with involved composition. Many of the paintings appear to be abstracts until you are drawn closer to discover the details. Margaret resides in Lititz, PA, with her husband Art, a retired geologist. She has two grown children who live in Baltimore, MD and Bangkok, Thailand. 2nd Place Watercolors: Lansdale Festival Of The Arts - "Junk Food"
1st Place Watercolors: Lansdale Festival Of The Arts - "Shoes"
1st Place Watercolors: Bel Air Festival For The Arts - "Shoes"
1st Place Watercolors: Bel Air Festival For The Arts - "Wine Corks"
1st Place Watercolors: Bel Air Festival For The Arts - "Nostalgia"
Best Of Show: Lititz Outdoor Art Show - "Blue Crabs"
1st Place Watercolors: Lansdale Festival Of The Arts - "Blue Crabs"
Honorable Mention Watercolors: Ocean City, NJ Boardwalk Art Show - "Blue Crabs"
3rd Place Watercolors: Bel Air Festival For The Arts - "Candy"
Honorable Mention Watercolors: Ocean City, NJ Boardwalk Art Show - "Ferris Wheel II"
1st Place Watercolors: Bel Air Festival For The Arts - "Paris Desserts"
3rd Place Watercolors : Lititz Outdoor Art Show - "Paris Desserts"
Margaret takes special pride in the quality of her limited edition giclée prints. Each print is made using the giclée process, as opposed to the offset lithography method. A giclée print (Discussion of Term) is an invented name for the process of making fine art prints from a digital source using inkjet printing. Each of her original paintings is digitally scanned at full size. The digital image is software-adjusted so that colors, brightness, contrast, and tone exactly match the original painting. Each image is individually printed in her art studio on textured, heavyweight, matte finish fine art paper, using an Epson Stylus Pro printer. The printer uses UltraChrome K3 ink, which is a pigment-type ink rather than a dye-type ink. Pigment inks are renowned for their very large color gamut, excellent water fastness and superior longevity (permanence rating as high as 200 years). Each limited edition print is individually signed and numbered.